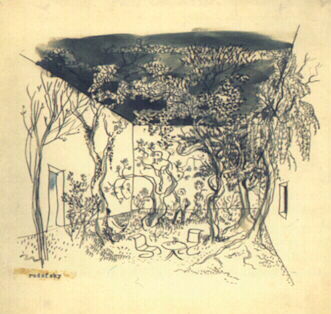 Bernard Rudofsky, drawing of "outdoor room," 1938, Italy. Reproduction with permission of Berta Rudofsky 2003. Disorientation: Bernard Rudofsky in the Empire of Signs, investigates architect Bernard Rudofsky's (1905–1988) rarely studied period in Japan in the mid- to late-1950s, identifying the manner in which his landmark exhibition of 1964, Architecture without Architects, was informed by the legacy of this encounter, one he cast as offering him a "rear-view mirror of the American Way of Life." Situating Rudofsky's work as more broadly marked by his encounters with modernity—from the violent wars of the first-half of the twentieth century and the subsequent Cold War period to the rise of information technology and the exacerbated deracination driving the period's growing territorial insecurity, the book focuses on the architect's peculiar formulations of disorientation and "non-communication." Through extensive archival and historical research, the book traces Rudofsky's "insights" into the impact of globalizing forces upon modern architecture. In contradistinction to readings of Rudofsky as seeking a mode of authenticity or a more "humane" architecture, it demonstrates that his work harbored a far more complex and provocative, and less nostalgic response to this historical condition and architecture's role within it. Felicity D. Scott is associate professor, director of the PhD Program in Architecture, and codirector of the Program in Critical, Curatorial, and Conceptual Practices in Architecture (CCCP) at the Graduate School of Architecture, Planning and Preservation, Columbia University. She is also a founding coeditor of Grey Room, a quarterly journal of architecture, art, media, and politics published by MIT Press since Fall 2000. Her work as an architectural historian and theorist focuses on articulating genealogies of political and theoretical engagement with questions of technological transformation within modern and contemporary architecture, as well as within the discourses and institutions that have shaped and defined the discipline. In addition to Disorientation: Bernard Rudofsky in the Empire of Signs, she is the author of: Architecture or Techno-Utopia: Politics After Modernism (MIT Press, 2007); Living Archive 7: Ant Farm (Actar Editorial, 2008); and Outlaw Territories: Environments of Insecurity/Architectures of Counterinsurgency. She has also published widely in magazines, journals, edited volumes, and exhibition catalogues.